Ideas for new recipes often come to my mind quite unexpectedly. Most of the time it’s just a combination, like Gorgonzola/currants/watercress. Other times, however, I’m seeing something on the market that I just have to try. Like in this case. Although I love pumpkins and squash, I thought of those pretty smaller variety often as not edible, purely decorative breedings, that people buy to place them on the window sill. Maybe you can imagine my excitement, when I saw these little treasures in my organic grocery store! To stuff them just seemed to be the natural solution in order to showcase their beautiful shape. So all I had to do was to think of a filling. I made two different ones for each variety of squash, but of course you could swap them or fill different varieties of squash with just one filling. I had a moment of surprise when I discovered that the gem squash wasn’t at all like I suspected. I imagined it to be like a round, small zucchini – in Germany it is actually called Rondini – far from it! It is more like a spaghetti squash with a very thick and hard skin and a mushy light yellow flesh. I ended up scooping it out, instead of cutting through it, which made the whole thing even more fun. Note: I have to admit that I made these a few weeks ago, when the pumpkin season started as these varieties are rather what one would call late summer squashes. But I’ve recently stuffed small Hokkaido pumpkins with a similar filling of buckwheat and it turned out to be equally delicious! Of course next to pumpkins, nothing symbolizes autumn as much as mushrooms. This year porcinis and chanterelles made a very early appearance on the market, so I could draw on plentiful resources. 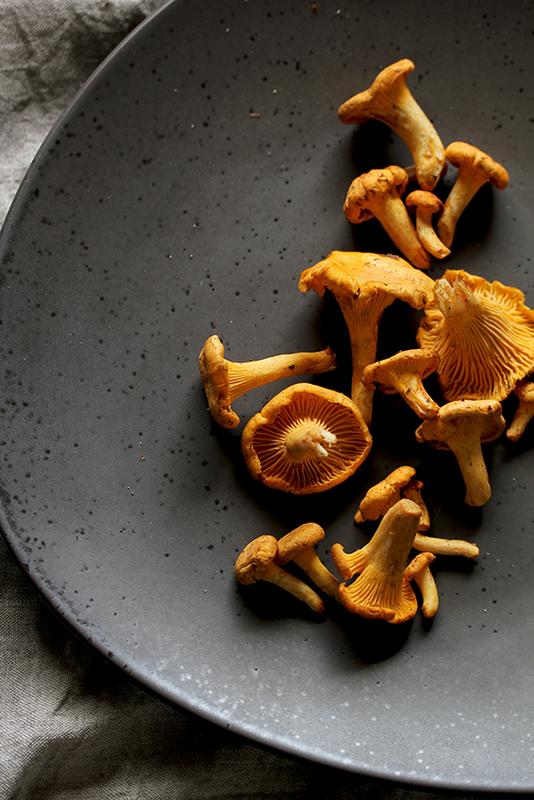 Ah, how I love chanterelles – probably my favorite mushrooms (but of course you could also make this recipe with other flavourful varieties). To add some extra ‘autumn flavour’ I was keen on trying out a new cooking technique, I read about some time ago: indoor smoking! Since I don’t have the opportunity to smoke something outdoors, the news of the possibility of indoor smoking seemed just to good to be true. I have to admit that I readily imagined my kitchen to be full of dark smoke and a smell I would never be able to get rid off – but the idea of this certain ‘smoking flavour’ was so tempting that I thought it to be worth a try. And I can assure you: it turned out to be perfectly simple, with no smell at all and a delicious result. You don’t even need any fancy wood shavings or something of that sort. I simply used organic (Important! You certainly don’t want to smoke your food in the emissions of loads of pesticides) green tea and I’m certainly going to experiment with other smoking goods. Although I am not a big fan of tin foil, in this case it seems to be necessary. Wrap the inside of your pot and the lid with it (see pictures), then place the tea in the middle of the pot’s bottom, set your steaming tool on top of it and scatter your ingredients on it. Heat the pot on the highest mark for about 3-4 minutes, until when you open the lid, there is pleasantly smelling white (not dark!) smoke. Leave the lid firmly closed and keep smoking on the lowest heat for 25-60 minutes, depending on the size of your smoking goods (I left the nuts and mushrooms smoking for about 40 minutes). 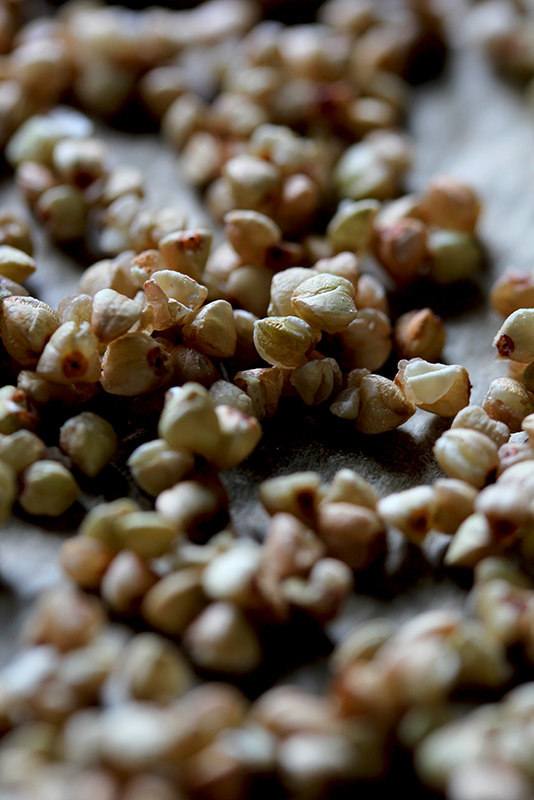 First of all, a note on buckwheat: I’m a huge fan of its nutty taste – definitely one of my favourite grains – however I personally dislike its texture when one simply soaks and cooks it. It turns into a rather slimy, porridge-like consistency. What I do to avoid that: I’m soaking the buckwheat over night with some kefir (lactobacilli help break down enzyme inhibitors and phytic acids) or some lemon juice, then I strain it through a sieve, place it on a baking tray and leave it to dry in the oven on a low temperature for about half an hour. Sometimes roasted buckwheat is referred to as kasha – so you might want to try this. You can of course skip the roasting bit, but it gives the filling some nutty-crunchyness. So first of all prepare your buckwheat, by soaking and then either cooking or roasting it (see note). Carefully clean the chanterelles and smoke them together with the walnuts for about 40 minutes. Cut off the tops of your pattypans and carefully scoop out the interior, discarding the seeds but saving the flesh. Heat a little coconut or olive oil in a pan and sauté the chopped onion together with the sqaushes’ flesh, seasoned with a little salt and pepper. Chop the parsley and grate the gruyère. Mix in a bowl with buckwheat, smoked nuts and chanterelles, onion and squash and season to taste with salt, pepper and nutmeg. Cut off the squashes’ tops and carefully scoop out the interior, discarding the seeds but saving the flesh. Roast the nuts in a pan without oil and put aside, then heat a little coconut or olive oil in the pan and sauté the chopped garlic together with the squashes’ flesh, seasoned with a little salt and pepper. Chop the herbs, dice the feta and the preserved lemon and slice the olives. Mix all ingredients in a bowl. 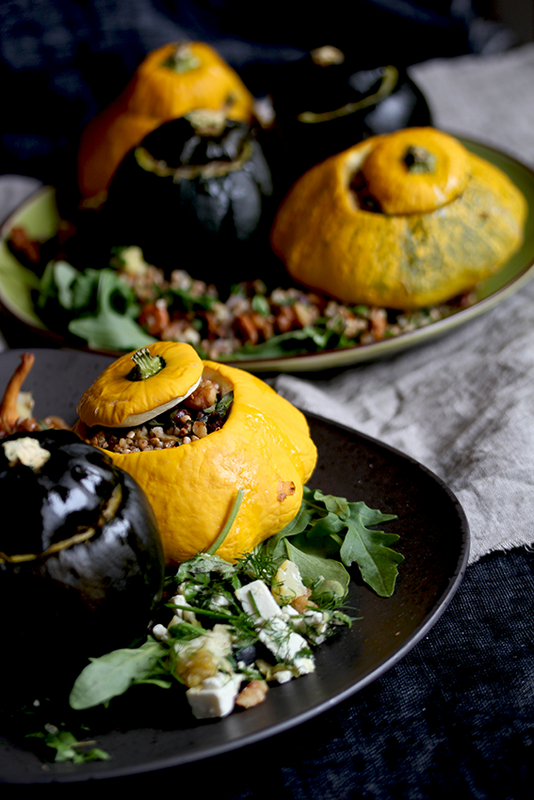 Stuff the squashes, top with their lids, place on a baking tray and drizzle with a little oil. Fill a shallow dish with water and place it on a rack on the lowest level in your oven. Place the baking tray with the squashes above it and roast them for about 50-60 minutes, depending a little on their size (they should start to get a few wrinkles and the flesh of the pattypan should have softened). Serve with leftover filling and some rucola with a basic dressing, if you like.